The Americans enter this Ryder Cup having lost four straight on European soil, missing several key stars who were on the last two Ryder Cups teams, and with a general perception that many of their players are out of form. Fair or unfair, it hasn’t been a noteworthy summer for most of the American team. In the last 25 PGA Tour events (dating back to March) the US team has won only three times (Bubba at the Masters, Kuchar at the Heritage, and Mahan at the Barclays) versus eleven times for the Europeans (six on the PGA Tour and five in Europe). Now wins aren’t everything, but the Americans will bring that cloud of underachievement and the baggage of past disappointments on European soil with them to Scotland. That they’ll be without Tiger Woods, Steve Stricker, and Dustin Johnson might be as large of a burden. Are the Americans actually off form? What about the Europeans? The perception is that the Americans have struggled this summer and the Europeans have thrived, but a lot of that is due to seeing Rory McIlroy trounce the field for a month. I looked at the performances of both teams over the last ten weeks relative to what my ratings expected and found little difference between the teams’ form. The Americans have their share of guys playing poorly (Spieth and Webb particularly), but Europeans Ian Poulter and Martin Kaymer have played awful in July-September. You can see the charts below. In all, the Europeans might have a couple more guys playing better than expected, but it’s not like most of their team is on fire. How much does Jim Furyk’s 1-8-1 four-balls record matter? It obviously matters in terms of how Tom Watson deploys his team because Jim Furyk is the elite player least suited to play four-ball in the world. His game is built on hitting fairways, hitting greens, and scrambling – things that are great at saving par on tough courses, but don’t lead to birdies as often as guys with aggressive games, like Phil and Rory. I looked back through Furyk’s career four-ball matches and his record isn’t a fluke – he and his partners have averaged losing 2 & 1. The blame can be shared equally though; in the six matches I have hole-by-hole data for, Furyk won seven holes and his partner won eight. The problem for the US is they only have seven guys who are clearly better than Furyk at four-balls. This year’s team is very conservative and built around guys who avoid bogeys more than they make birdies. 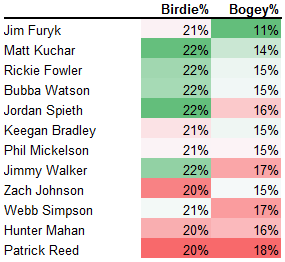 Furyk’s Birdie% is eighth best on the team and he obviously blows away the competition in avoiding bogeys. I certainly wouldn’t fear playing Furyk over Webb or Patrick Reed in four-balls, at least for one match. Phil’s obviously had a down year by his standards this year with only a single top-ten (his 2nd at the PGA Championship). Phil’s run as a top five elite player ended a few years ago when his iron play started to fall off, but he’s managed to paper that over for a few years with a run of great putting and his always amazing short game. This year the true decline started as he fell back to Earth on the greens and couldn’t get his long game back to standards. He’s still capable of contending in big events, but the real question is how juiced he’s going to be these matches. If he’s been working for the last few weeks to be in major shape, he’ll still be an asset for the US. It’s almost set in stone that Phil will pair with Keegan Bradley after they went 3-0 in 2012 and 2-1-1 at the 2013 Presidents Cup. I discussed Furyk’s four-balls woes above. His record in that event is almost unbelievable at this point, but it obscures a .500 record in the other matches, which actually is respectable for an American playing in this recent run of European success. Furyk is playing as well now as he has in almost a decade; since returning from a month off at the Open Championship he’s been second only to McIlroy in performance versus the field. His brilliance with his irons is matched only by Sergio this year and his short game was fantastic. His hit fairways, hit greens, and scramble when necessary game is absolutely perfect for foursomes matches. I’d be fine seeing him alongside Zach Johnson, another guy who has the perfect game for foursomes. Furyk has one of the largest disparities on Tour in his success from the fairway relative to his success from the rough, so it’s imperative that he play with a partner who hits fairways off the tee. In his third Ryder Cup I think Kuchar’s probably ready to assume a role as veteran mentor to the younger guys. Kuchar’s emergence in 2010 began a five year run where he’s been the most consistent player in golf. He’s posted five straight nearly identical seasons and has remained in my world top ten ever since 2010. He’s often overlooked when we talk about the best out there, but he’s right up there in terms of performance with a guy like Justin Rose. He has a true all-around game that makes him ideal for both four-balls and foursomes and I expect he’ll play at least four matches. He kind of confirmed today he’ll be playing with Jordan Spieth which makes sense in terms of the veteran-rookie dynamic and also because they both have similar all-around games. He’s my guess to be the top scorer for the US. Bubba enters his third Ryder Cup as a veteran and the holder of the only US major title this season. He began the year white-hot with a win at Riviera, contention in Phoenix, a close 2nd to Patrick Reed at Doral, and the Masters title, but quieted in the 2nd half. Bubba was always great at driving the ball, but in the last few years he’s really taken off because he’s refined his approach shots and short game to acceptable levels. Everybody loves the comical distances he can hit the ball, but he’s also really good at hitting irons out of the rough (an important skill for how often he’s in it). His aggression/distance will make him great in four-balls, but he has enough of an all-around game to be fine in foursomes/singles despite the career record (0-4). Signs point to him reprising his partnership with Webb Simpson. Mahan received a captains pick into this year’s matches – his second one after winning 3.5/5 points in 2008. Mahan’s season has been disappointing by recent standards and I think Tom Watson really overreacted to a few good weeks in August when he picked Mahan, but he shouldn’t be a huge liability for the Americans. As far as motivation, his chunked chip to end the US comeback in 2010 had to have given him a little extra when he’s been on the range the last few years. He may go out with Zach Johnson in foursomes to reprise their pairing from 2010. He’s ideal for a guy like Zach or Furyk who plays well out of the fairway because he’s one of the best on Tour in combining distance and accuracy off the tee. Zach’s gotten lost in the shuffle this season as his best performances have come early in the year when no one’s paying attention (Tournament of Champions and Humana) or right before the Open Championship (John Deere). He’s had another steady year, though without his normally great putting. If that returns this week, he becomes a lot more dangerous. Zach’s a lot similar to Furyk in terms of being short and accurate off the tee, though he typically putts it a little better. He’s an ideal foursomes player for the US, but I wouldn’t even consider playing him in four-balls because almost all of his value comes from avoiding bogeys rather than chasing birdies. No way to sugarcoat it, Webb’s had a pretty poor year. He entered the season around 10th in my ratings after a three year run that made him look like one of the American stars for the future, but contended in only three minor tour stops after February and has fallen to 32nd. 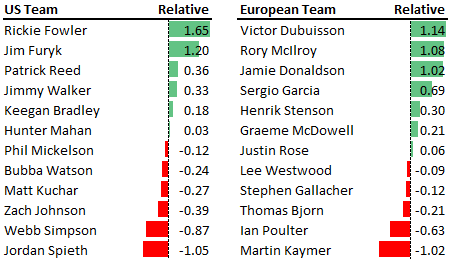 His performances since the Open Championship have been poor in aggregate, but that’s been entirely driven by really poor (and out of character) putting. I expect Webb to rebound with the putter soon, maybe even to fuel the US this week. He has a solid all around game that should fit well next to Bubba, especially playing as the more conservative half of a four-ball pairing. Reed’s early season hot streak pushed him from 180th to 45th in my ratings in the span of only eleven weeks and prompted him to throw down the gauntlet to the rest of the Tour. Despite not being able to back his comments up, he still finished the season respectably. His rating is the worst on the US team though, so my expectations for him are low. He practiced today with Zach Johnson, Mahan, and Furyk, which means Tom Watson is probably looking to hide him alongside a veteran in a foursomes match or two. That’s probably the ideal situation, though if the US is down Saturday they should keep him benched. This is, I think it’s fair to say, the most important week of golf in Jimmy Walker’s life. After riding a hot putter to three wins to start this season, he continued to play well in big events (top tens in the Masters, Players, US Open, and PGA Championship). I’m very bullish on Walker this week because he has the aggressive mentality for the four-balls matches. Walker’s extremely long off the tee, but he’s so inaccurate that it’s mostly a wash. He’s taken off in the last two years with a much improved iron game and has always had a strong putter. It looks like we’ll see him paired with Rickie Fowler, which is the ultimate boom versus bust pairing for the Americans. Fowler enters his second Ryder Cup riding one of the hottest streaks of anyone in recent seasons. After undertaking a swing change with Butch Harmon early this season his tee to green game has been fantastic. I’ve written recently that he’s riding an unsustainably hot streak with the putter, but he’s typically been a good putter and even when that luck runs out he’ll be a top 20 player in the world. He’d fit with any of the other aggressive, longer players in both formats. He and Jimmy Walker are maybe the most likely pairing to win 5&4 or lose 5&4 while losing a few balls. Spieth enters these matches in a huge slump. None of the 24 players here have struggled more in the last ten weeks than Spieth. In general, his long game (irons+drives) has been mediocre in the second half. That’s concerning because short-term struggles with the long game typically persist longer than struggles putting. I’d love to see someone look Spieth’s swing from January and compare it to his swing now because the results are monumentally different. Spieth is still statistically one of the better Americans because he’s been very successful prior to the last few months, but we could be looking at a completely different guy now. Keegan exploded onto the scene at the 2012 Ryder Cup, pairing with Phil to win three straight matches and then succumbing to Rory at the previous height of his powers in singles. His season hasn’t really been noteworthy in terms of big results or wins; he’s just been very consistent at getting top-tens and twenties. Keegan’s main asset is a great long game. His combo of big, accurate drives and long irons allows him to stay out of trouble and hit a ton of greens. He’s kind of assumed to be a really aggressive player, but his game is more oriented to foursomes honestly. He looks likely to try to continue his success alongside Phil. Keegan would be my pick to go out five matches if the US needs it.